If you’re looking for a compact rig for the Panasonic GH4, Zacuto’s Target Shooter is a great option that gives you rock-solid stability without adding a lot of bulk. Even better, I’m going to show you how to save over $150 on the Target Shooter while also customizing it for the GH4. The GH4 is small and lightweight– it’s one of the best things about this camera. Why would you want to add a big rig that would make the GH4 more bulky and unwieldy? However, a rig is still highly recommended for shooting jitter-free handheld video without having to limit yourself to lenses with built-in image stabilization (which is basically a small selection of Panasonic lenses). The answer is simple– you need a minimal rig. Does the job without adding a ton of bulk — You can stay light and mobile but still shoot stable footage at a moment’s notice. Packs up small so you can always have it with you — A big shoulder rig that needs a backpack to transport means you’ll only have it when you plan for it. At all other times, you’ll be at the mercy of your shaky hands. Keeps you from standing out — You can spot a big camera rig from a mile away, usually because it’s sitting on the shoulder of someone sweating bullets and grimacing in pain. A minimal rig will let you get close to the action without being noticed. Bottom line: Who needs a rig? You do (especially if you shoot with lenses 35mm or longer). An in-depth review of Zacuto’s Target Shooter is coming soon, but I wanted to share this deal with you now because it won’t last forever. The Target Shooter has two main points of adjustment– the Zwivel and the Gun Stock. 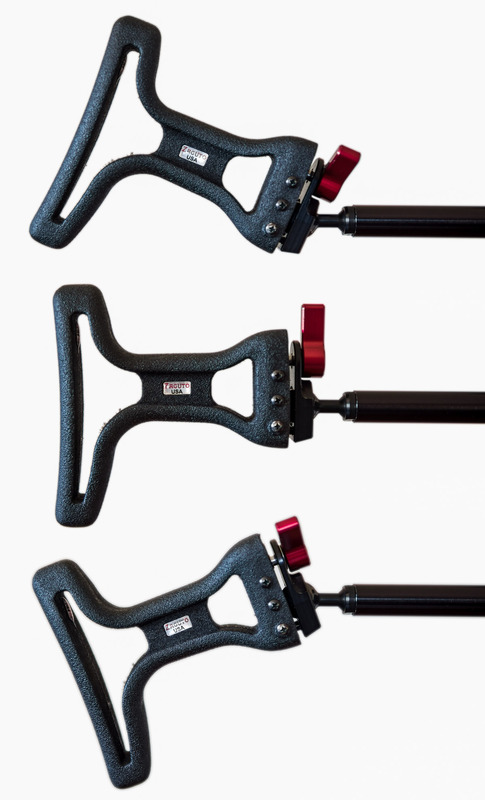 The Zwivel can lock the two 15mm rods at virtually any angle, allowing you to position them for optimum comfort and stability. 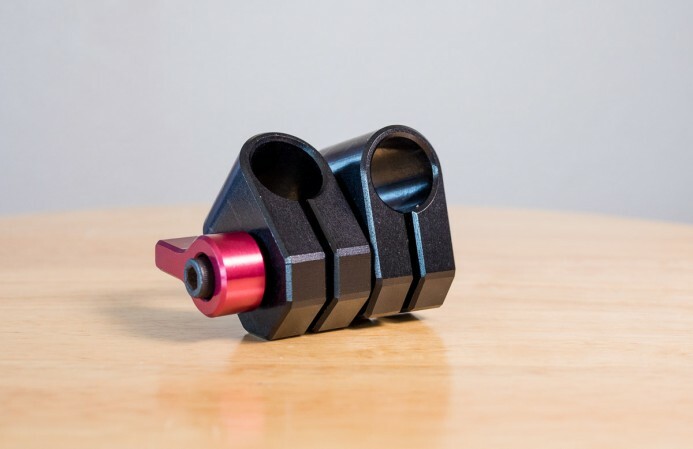 The Gun Stock has a ball joint that provides a lot flexibility for dialing in a comfortable position. 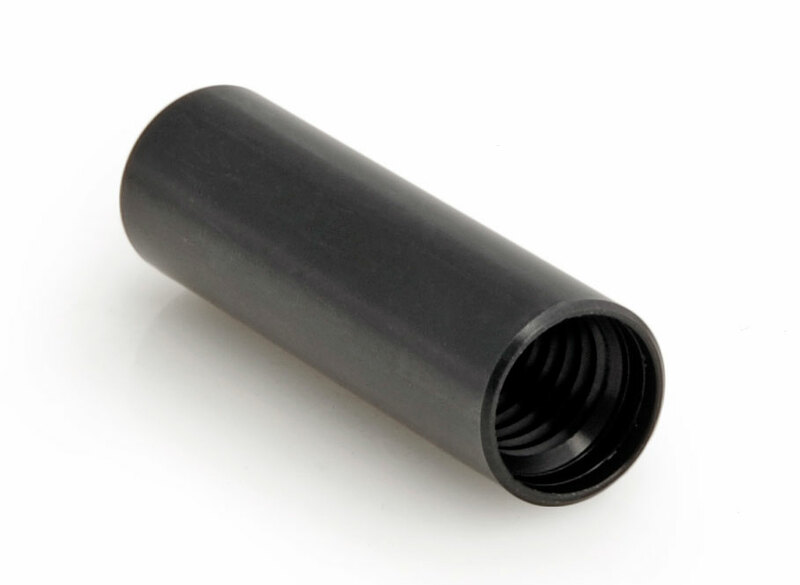 Finally, since the Target Shooter uses standard 15mm rods, you can adjust the length of these rods to fit you perfectly. Every adjustment point (like the Zwivel and Gun Stock) locks down so that you can brace the Target Shooter against your body for support without worrying whether it will fold under the pressure. When you are done shooting, the Target Shooter folds up into a surprisingly small package to easily fit in a camera bag or even a pocket (especially with the customizations we’ll discuss in a bit). Sometimes you need a bigger rig, and the Target Shooter’s Gorilla Plate is the foundation for that rig. With the Gorilla Plate, adding rods, handles, a follow focus, external records, monitors, and even a shoulder pad are all quick and easy. Here’s a video from Zacuto with more information on the Target Shooter. Bottom line: The Target Shooter is a solid minimal rig that packs up small, but can also be expanded when you require a larger rig. The Target Shooter normally retails for $500, but it is currently available directly from Zacuto for only $300. Update: Sold out. The only option is currently the customized option described in this guide. That’s already a fairly reasonable price for a rig as solid, adjustable, and expandable as the Target Shooter, but we can do better. Zacuto’s $300 sale price is looking even better now when you compare it to buying the components separately (over 35% savings). If buying components separately ends up being more expensive than the bundle, how can we bring the cost down any further? The key to getting even more savings is Zacuto’s Clearance Section. The DIY Target Shooter provides a whopping 42% savings over buying the normally-priced components and a respectable 10% savings over the already-discounted bundle price. Not too shabby at all. Aside from the savings, another nice thing about the DIY Target Shooter compared to the standard Target Shooter is that you can save even more by only getting the components you need. 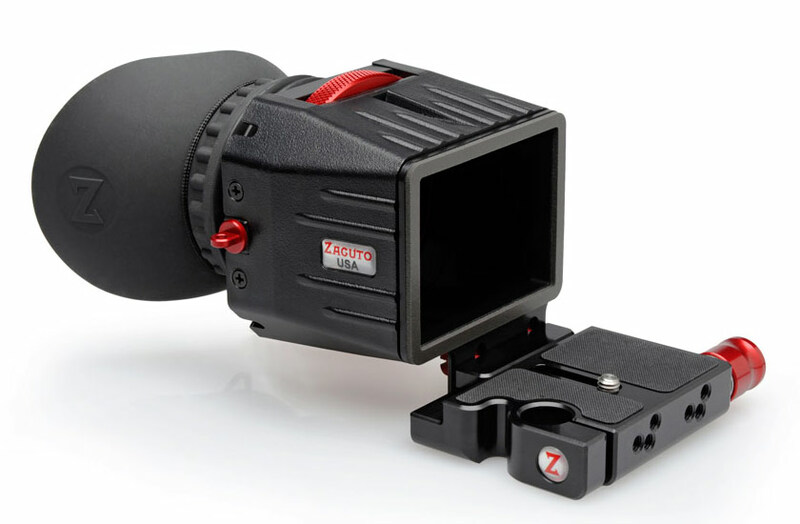 For example, if you already have Zacuto’s Z-Finder LCD loupe (which also includes the Gorilla Plate) you can save an additional $69 instead of buying the standard Target Shooter and ending up with an unnecessary Gorilla Plate. Already have a couple spare 15mm rods? You just shaved off another $52. Then, all you need is the Zwivel ($55) and the Gun Stock ($95), bringing your final cost down to $150. Bottom line: You can save up to $150 compared to buying the standard Target Shooter if you already own some of the Target Shooter’s components. 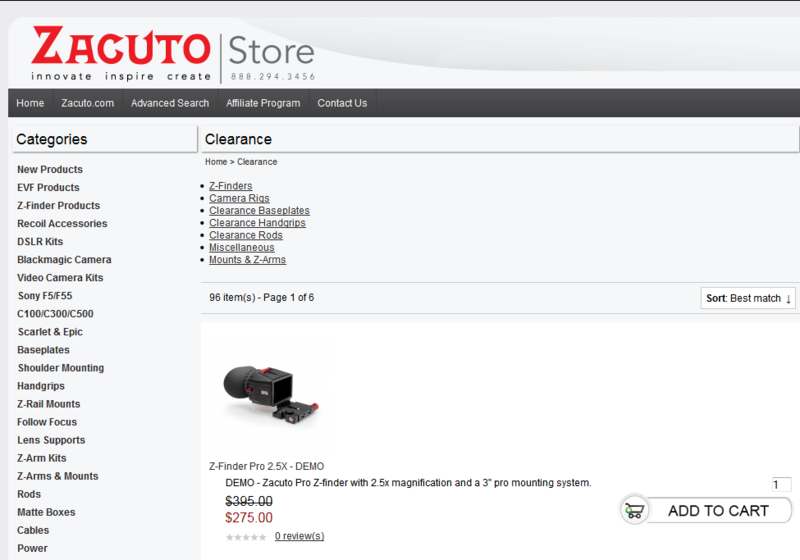 Don’t worry, the deal gets even sweeter, but first, let’s talk about what buying clearance items from Zacuto means. 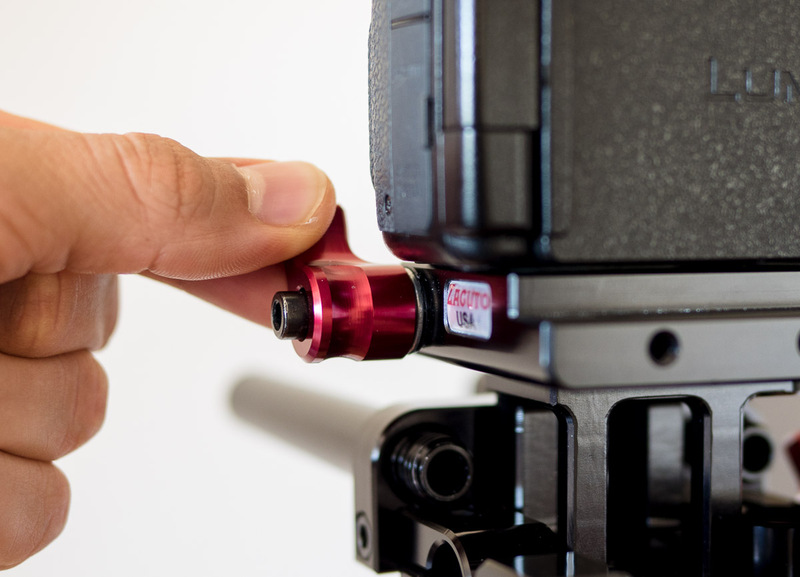 Basically, Zacuto says that clearance items are fully functional (and include a lifetime warranty) but may have cosmetic defects such as scratches or dents. I wanted to find out for myself what this really meant, so I placed an order for a DIY Target Shooter using items from Zacuto’s clearance section. After closely inspecting the clearance items, I could not find a single issue (cosmetic or otherwise)– they looked brand new. Of course, your mileage may vary as items could be placed in the clearance section for different reasons. That said, I don’t think you should have any qualms about buying clearance items from Zacuto. Even if there were a few nicks and scratches, all that really matters is that it works. Bottom line: The clearance items I received look brand new. 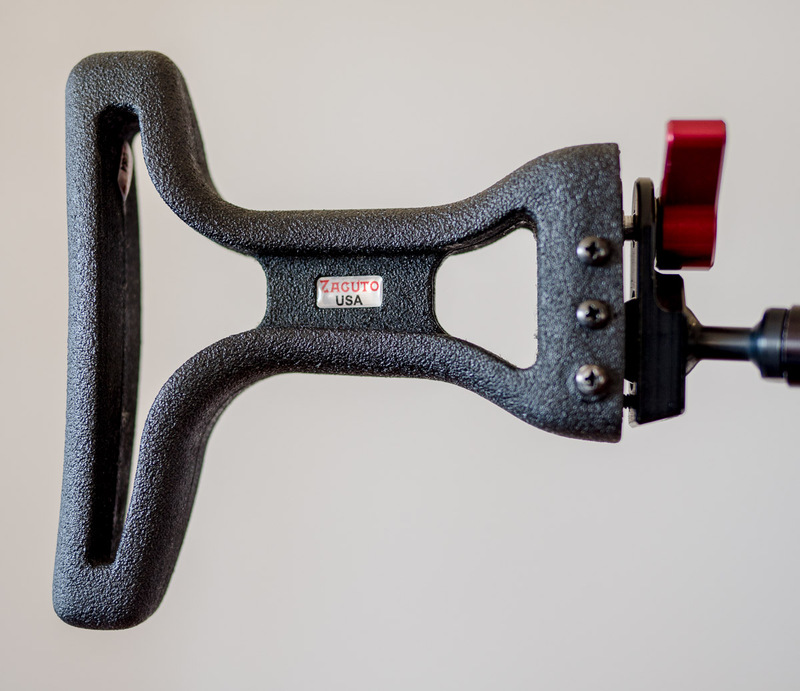 While the condition of clearance items may vary, they will be fully functional and are backed by Zacuto’s lifetime warranty. With the DIY Target Shooter, you can also customize the rig to fit the GH4 even better than the standard Target Shooter. 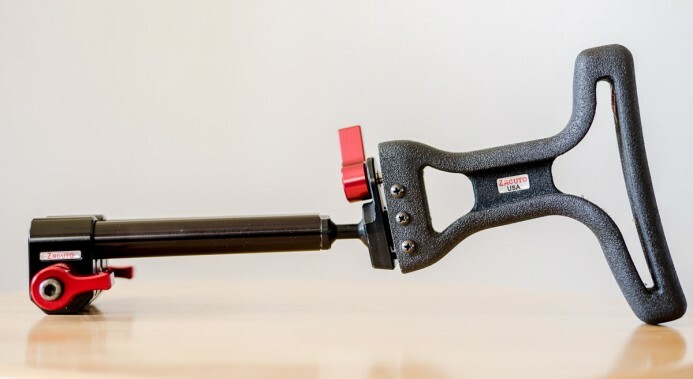 For example, I’ve found that a 4.5″ rod connected to the Gun Stock (as used in the standard Target Shooter) is way too long and results in a lot of excess rod sticking out in front of the rig. Instead, a 2″ 15mm rod connected to the Gun Stock is much cleaner, while still providing enough range of adjustment to use the GH4’s EVF or its LCD with a loupe. This is the sweet spot for me, but you can also customize the DIY Target Shooter further by using a longer vertical rod if you’re taller or want to position the Gun Stock lower on your chest. Zacuto’s Gorilla Plate may be small, but it serves as the foundation to easily expand your rig from the minimal Target Shooter, all the way up to the shoulder-mounted Recoil system capable of supporting a cage, follow-focus, handles, EVF, and more. This means that the components that you start with for the DIY Target Shooter can be expanded and built upon according to the needs of each project. Stay lean and mean with the minimal Target Shooter when you’re shooting run & gun, or go shoulder-mounted with the Recoil when you need to support an external recorder and cinema lenses with a follow focus for narrative filmmaking. It’s your choice– build it up, keep it lean, or anything in between. 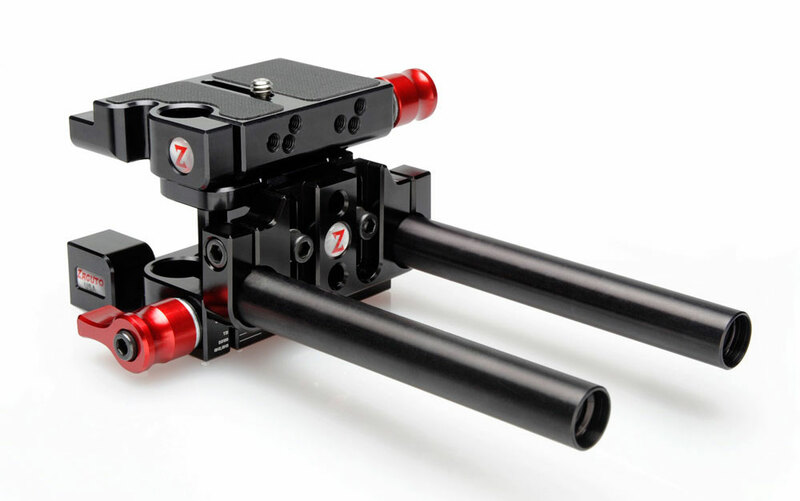 We’re focusing on minimal rigs in this guide, so I’m just going to touch on one piece of gear that will allow you to easily take your rig to the next level– Zacuto’s Mini DSLR Baseplate (MDB). When you need rods, the Gorilla plate drops on the MDB in seconds and locks with a twist of a knob. When you’re ready to strip the rig down, the Gorilla Plate pops off just as quickly. 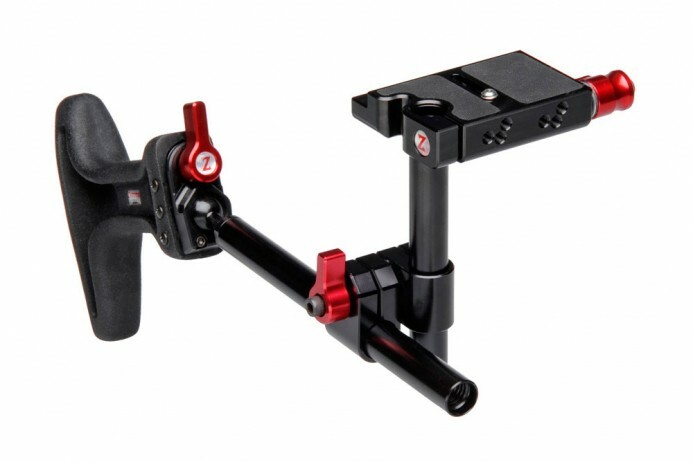 The MDB is a great option for expanding your rig in the future, but why do I bring it up now? Here’s the thing: the Mini DSLR Baseplate includes the Gorilla Plate. If you know you’ll need rods in the future, you’re better off getting the MDB now instead of the standalone Gorilla Plate, rather than buying it later and ending up with an extra Gorilla Plate (and spending $70 more in the process). Note: I asked Zacuto and there is unfortunately no way to buy the MDB without the Gorilla Plate. The DIY Target Shooter is definitely the best option, saving you nearly $100 compared to getting the standard Target Shooter, and close to $200 cheaper than buying components separately. Bottom line: If you needs rods for certain projects, get the Mini DSLR Baseplate with the DIY Target Shooter and take your savings to the bank (or camera store). Saving upwards of $150 not good enough for you? Fine. 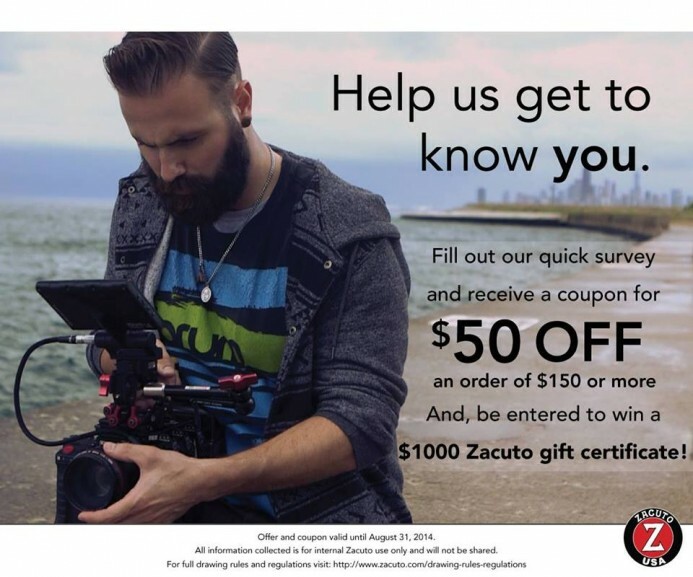 Here’s how you can save an additional $50 with a coupon from Zacuto (for a limited time). Just take a few minutes to fill out Zacuto’s survey, and they’ll give you a coupon code at the end for $50 off when you spend $150 or more at their site (which just happens to be the starting price for a DIY Target Shooter). Final Price for the DIY Target Shooter: $211.25 (or less). Notice: This coupon is only valid until August 31, 2014. Make sure to fill out the survey, get the coupon, and place your order before then if you want to save $50. Bottom line: Do short survey. Get $50 coupon. Dance. Zacuto is known for their well-engineered products and high build quality, but also for high prices that usually put their rigs beyond the budget of many solo shooters or small production teams. Now that you know the secret to saving $150 or more with the DIY Target Shooter, you too can benefit from Zacuto’s impressive build quality and lifetime warranty without breaking the bank. The DIY Target Shooter is already one of the best minimal rigs you can buy, but at this price, it’s a no-brainer. You no longer have any excuse for shaky footage.